Apple Music launched in India almost four years ago, bringing the catalog of over 50 million songs to the country. 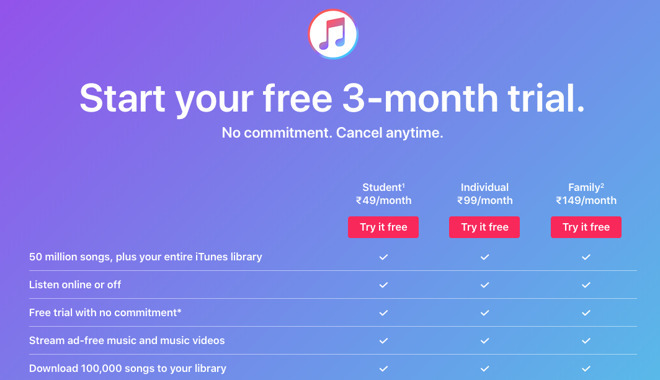 Originally the subscription rates for Apple Music put the service at 120 rupees ($1.73) per month for individuals, 60 rupees ($0.87) for students, and 190 rupees ($2.75) for families, and the pricing has stayed the same throughout its life. According to the Indian Express, Apple has updated its subscription tiers to make them cheaper. Students now have to pay only 49 rupees ($0.71) per month for the service, with the Individual plan at 99 rupees ($1.43) per month, and the Family plan at149 rupees ($2.15) per month. The timing of the price drops is likely due to the availability of Spotify and YouTube Music in the market within the last few weeks, with Apple keen to undercut the competition. Spotify still offers an ad-supported tier, just as with other markets, but its plan for a single user costs 119 rupees per month, effectively the same as Apple Music’s old rate. Both Spotify and Apple Music are cheaper than YouTube Premium, which charges 129 rupees ($1.86) per month for one user. The price cut of Apple Music follows after another of Apple’s corrections, with reports of Indian resellers lowering the cost of the iPhone XR surfacing on Monday. The 64-gigabyte iPhone XR dropped to 59,900 rupees ($875), a reduction of 22 percent.